High blood cholesterol can put your senior at high risk for serious health problems, including stroke and heart attack. As a family caregiver, if you learn your senior’s blood cholesterol levels are elevated, it is important to make changes to your care approach to help them reduce their cholesterol levels, and lower the risk of these serious complications. Fortunately, there are many simple and accessible ways to do this. Help them stay compliant with medications and instructions from their doctor. If your parent’s blood cholesterol level is high enough, the doctor and they recommend medications and other treatments that work with their body to reduce these levels. Staying compliant with them is critical to getting the most benefit. Medication reminders from a senior care provider can be a valuable step toward staying compliant. Reduce their weight. Even shedding a few pounds can make a difference for a senior with high cholesterol, and getting them to a healthy weight can be critically important. Talk to their doctor to get recommendations for safe and healthy ways to trim pounds. Swap the fats. Fat is an essential nutrient, but it is important your parent gets the right kind of fat, and in the right amounts. Animal fats, trans fats, and saturated fats all contribute to high cholesterol and higher risk for complications. Help them swap out these fats for healthier options, such as olive oil, avocado oil, and corn oil. How can senior care help? The customizable nature of senior care is what makes it one of the best decisions you can make for your aging parent. As their family caregiver, you want what’s best for them. Whether they are dealing with a variety of serious health issues, balance problems, mobility issues, lack of activity and social engagement, or other issues, this care can help. 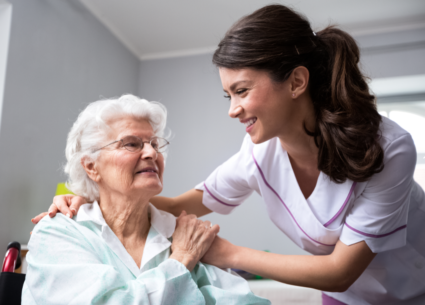 A senior home care services provider will be there for your parent on the schedule that is right for not only their needs but also for the care you give them and provide a set of services designed specifically with your parent in mind. These customized services are tailored to helping your parent protect their health and safety, enjoy more independence, stay more active, and have a higher quality of life as they age in place. If you or an aging loved-one are considering Elder Care in Bloomfield, PA, please contact the caring staff at In-Home Quality Care today.